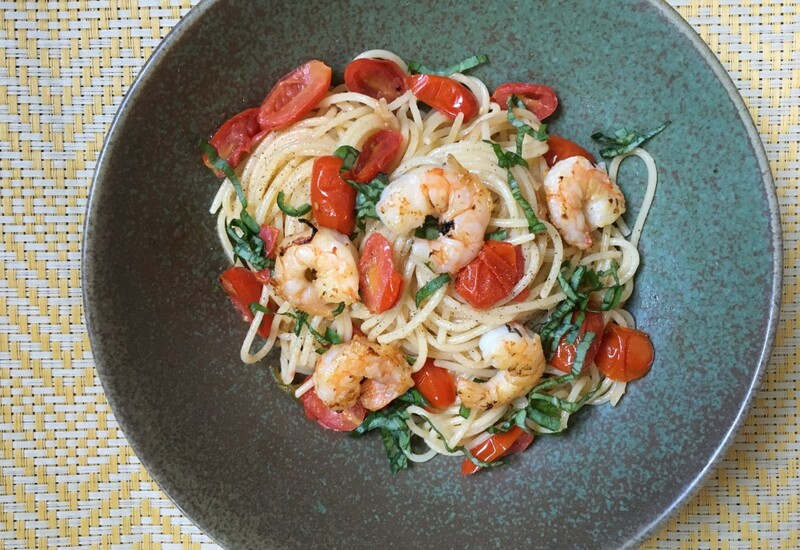 Spaghetti is dressed with pan-fried tomatoes, serrano peppers, and basil and topped with shrimp, creating a quick and easy meal perfect for a fancy weeknight meal or for a date night. Serve with a crispy green salad and a glass of wine for a complete meal. Wear plastic gloves when handling the serrano pepper to avoid accidentally hurting your eyes or face. Add extra serrano pepper at the end if you’re looking for a bigger kick. Per Serving: 568 calories; 25g fat; 46.6g carbohydrates; 34g protein; 262mg cholesterol; 1304mg sodium. I really really enjoyed this dish. I used rose and that gave the tomato a softer and more refined taste. I used half of a Serrano pepper (as it can be really spicy) but did not feel it was spicy enough so next time will use the full pepper. This pasta dish was perfect to prepare during these hot and summer days. The sauce was light and refreshing. Really enjoyed the slight bit of heat from the serrano pepper. I had some rose on hand and I was pleasantly surprised by the flavor since I have never cooked with it before. Will make this again! This dish was delicious! I have always wondered how restaurants got such simple light sauces on shrimp dishes and this one did exactly what I wanted it to. When I've tried to make similar sauces I've ended up with greasy over buttered sauces, but this one (maybe it's the pasta water?) was light and airy. The white wine I used also gave good flavor. One of the best things I've ever cooked. 5 stars all around. I’ve been making a version of this for years that my little one never tires of. I also include sautéed portobello mushrooms and toss in fresh spinach before serving. It wilts down quickly with the heat. Top it off with fresh grated or shaved Parmesan. Please don’t ruin this dish with the kraft Parmesan powder stuff! Buy a chunk of Parmesan and grate your own. You’ll love it! This recipe was super easy to follow and make. I would grill the shrimp for added flavor but the sauteed version is perfectly fine. i would also add some sliced scallions at the end. This recipe had potential. It coulda had class. It coulda been a contender. It coulda been something...instead it bummed me out. The overall recipe is great and I think it would make a very good pasta dish but the addition of the Serrano kind of ruins the flavor profile. I like spice so I thought the sound of Serrano was nice but here you are, eating this perfectly Italian pasta-it’s light, lemony, complex, slightly sweet-yet savory, and then...that bite...and you wonder..where did this Mexican food come from? Now I love Mexican food and I love Serranos but this is not the time or place for either. The spice is out of place and entirely changes the makeup of what would else-wise be a very good pasta. I’m sure I’ll make it again sans the pepper though.